Little Corner of Happiness - Jill Ruth & Co. I have these little vintage salt and pepper shaker vases in my laundry room and have posted about them here and here. They have been sitting empty most of the winter except for the occasional dry flower/weed I stuck in them. I'm so happy to have a few things blooming to have my little vases full again. Here is a sprig of basket of gold Aurelia, and some ground cover (can't remember the name). Lilly of the Valley...so fragrant! 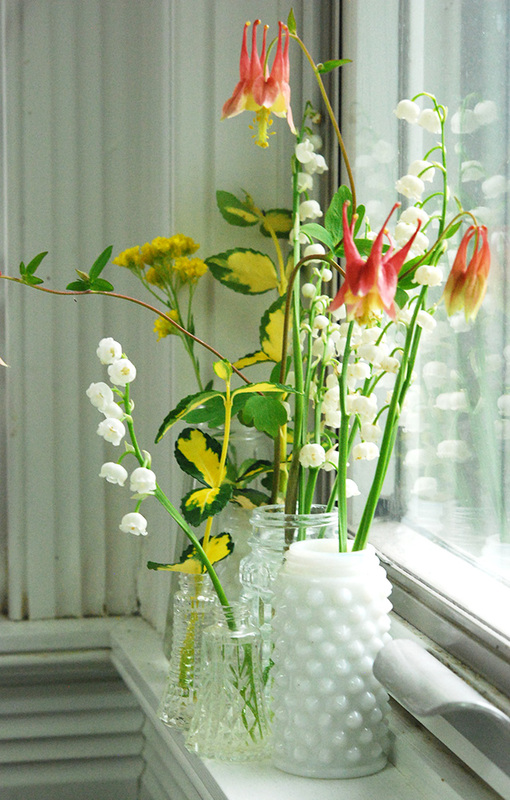 These tiny vases in this little corner really are fun for me. 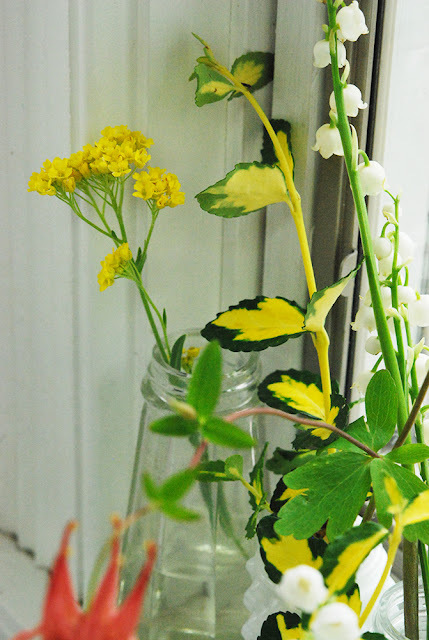 It takes little to fill them and a sprig that looks like nothing out in the garden becomes a focal point in a little vase. Most of the time in life you need to look at the big picture and not at the little details when you are stressed. BUT, when there is an overwhelming amount of work to do...finding joy in something simple is a blessing. Which is why I won't post a picture of the whole room...that would bring none of us joy :) and I would have titled the post, "Big Room of Lots of Work"
I'm linking my little vintage shakers up with Debra for Vintage Inspiration Friday. I love your vintage salt shakers - honestly, somewhere in my past I remember either mom or grandma having the hob nail ones! Just beautiful, and the flowers are gorgeous. This year I met, for the first time, the lilies of the valley, and I think I am going to want some. 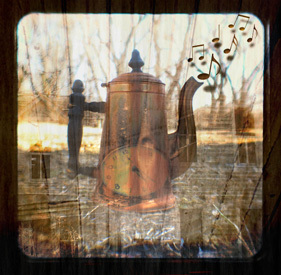 Thanks so much for sharing at Common Ground's Vintage linky, and I shared some "follower" love whie here! LOVE the colors! So springy & bright! Thanks for sharing! I love using salt shakers for little vases. Yours are so pretty! LOL! I understand about the "whole room" thing... but I'm glad you posted your vases! 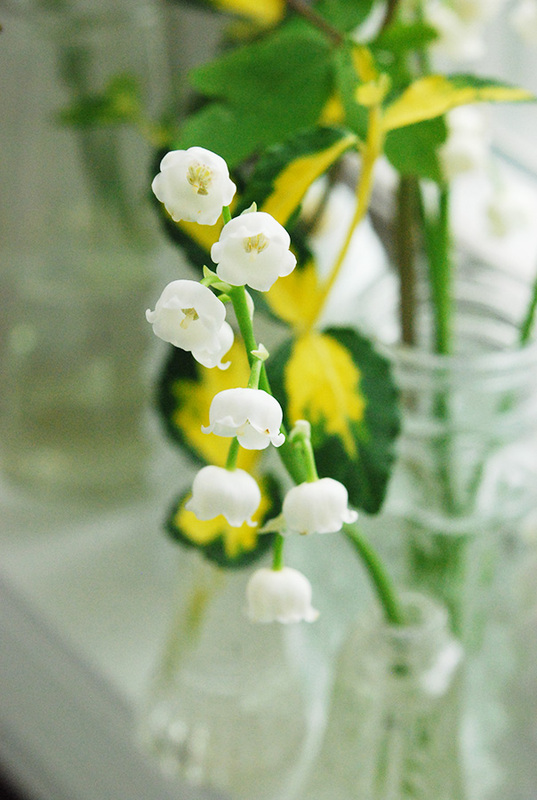 The Lily of The Valley is GORGEOUS!!!!! Having something pretty to focus on does make a difference. And life is messy - if rooms were always in order, nothing would get done! 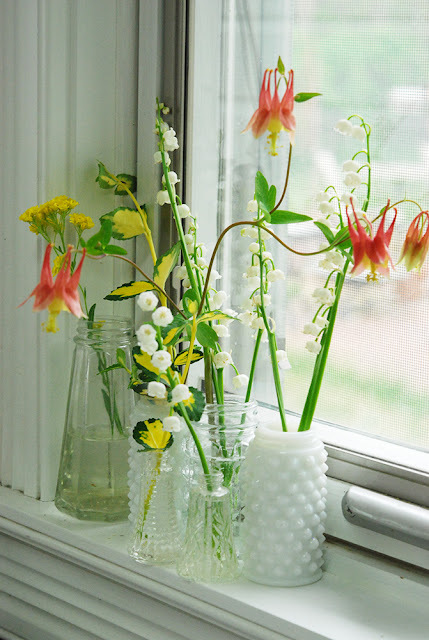 Your mini vases and flowers look so full of life and sunshine! Come on, show the whole room so the rest of us can feel normal! hee hee! Beautiful pictures...love the light effect on them. I can almost smell that lilly of the valley. As kids we always ate the tips off of the honeysuckles. Do kids still do that anymore?! Loved the little nuggets of wisdom you tucked into this post as well, Jill! Beautiful! Those would make me smile every time I saw them. so charming - lily of the valley always makes me think of my childhood in Wis - we had a huge patch growing in the backyard - I rarely see them in the Pacific NW - wonder if they don't like it here! your insight is right on! have a wonderful weekend! So sweet Jill! I've got bunches of lily of the valley - in fact the other day I walked right by it (several times) and thought...what IS that glorious smell?!! It's been raining too much to notice the fragrance...yesterday there was no rain - so imagine my supprise when I figured it out - duh!! :) I think I'll go find some vases to put in my window so I can pick some to tuck in them - lovely! Great inspiration. Love what you've done. Oh, I, too have windowsills of delight - and rooms of - someone should really do some organizing here! Thanks for the ideas of sprigs of flowers! Simple to do! Such a sweet idea~ thank you for sharing! I agree, just look at the little pretty parts, it helps so much to do the work:) Happy weekend sweet girl! Wonderfully pretty blog.... and I LOVE your header. Deee.light.ful. I am so happy to be able to FINALLY pick a few posies from my yard. It's been a LONG winter here in the Pacific Northwest. I have a few little French yogurt containers filled with some little bits of snowball around today. Whooopeee! Thanks for sharing your bright spot with us. It made me smile.